Fr. Pedro Tomaselli, PIME, Brazilian PIME Missionarry in Japan. Brazilian PIME Priest, Fr. Pedro Tomaselli, PIME, carries out his daily mission just north of the modern sprawl of Tokyo. On weekdays, this means that only two people attend Holy Mass, with a maximum of 100 people showing up on Sundays. 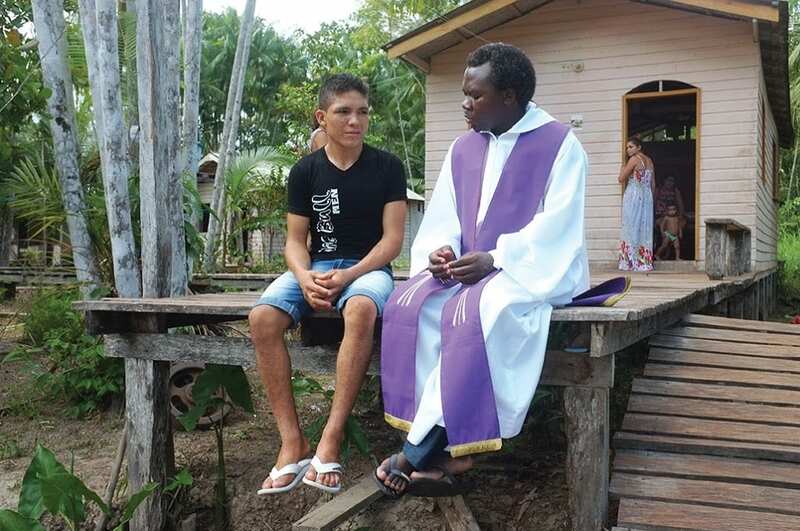 Despite the low number of parishioners, the great spirit of the people gives Father Pedro hope; his perseverance is reaffirmed by the strength of the friendships that he has created here. Fr. Pedro Tomaselli, 42, is a PIME Priest hailing from Santa Caterina in the South of Brazil. Fr. Pedro has lived in Japan since 2008, serving as pastor in two cities, about a 40 minute drive from each other: Ashikaga and Sano, in Tochigi Prefecture, just north of Tokyo. About 25 Japanese participate in Sunday Holy Mass; other worshippers come from the Philippines, Vietnam, Bolivia, Peru, a couple from China, and a few students from Africa. In total, they number barely 100 people on a good day, and the weekdays are noticeably scarcer: only two people attend the service. “We must leave the outcome in God’s hands, because if one were to rely on what he can accomplish on his own, one would quit Japan immediately.” states Fr. Pedro. Fr. Pedro had been impressed by the unique firsthand experience of Faith in Japan while he was still just a young seminarian as the missionaries who had seen it firsthand recounted it to him. Fr. Pedro was first exposed to the mission in Asia during his time studying philosophy in the Philippines. Throughout his four years there, Japan had never left the forefront of his mind. American-born PIME Missionary, Fr. Mark Tardiff,piqued his interest when he came to meet the seminarians individually. An experienced Japanese-missionary himself, Fr. Mark was then serving as PIME General Advisor and came to assess the seminarians’ three countries that they would choose as their adopted mission land. Without hesitation Fr. Pedro told him: “Thailand, Japan, and Mexico.” God had different plans however, and Fr. Pedro spent three years back in his native Brazil serving in missionary outreach. His missionary story was once again revitalized by a phone call from Rome; and at age 33 he finally set out for Japan. Father lives alone in the rectory of a multinational parish in Ashikaga, north of the sprawling Tokyo megalopolis, he also oversees a parish in Sano. Although only 25 Japanese attend the weekend Holy Masses, he has 187 names committed to the parish. An inherent ability of a PIME Missionary is being a man of many languages; Fr. Pedro is no different. He always says the Holy Mass in Japanese at least once over the course of a weekend, but he also says it in Vietnamese, Tagalong, and sometimes even in English. Syncretism, or the mixing of religions into an amalgamation of one’s choosing, is a commonplace practice in Japan. Fr. Pedro explains: “Being Japanese is almost like a religion. I asked a youth, ‘What is your religion?’ And he answered: ‘My grandparents were a bit Shintoist and a bit Buddhist; my parents a bit Buddhist and a bit indifferent, I am Japanese.’” Fr. Pedro holds out hope that the great joy of the Gospel will break through these notions. Despite these culturally- imbedded and widespread difficulties he ends his story about this young man pointing out signs of hope even amid evident inconsistencies. “Even amid such syncretism,’ Father concludes, “he confided in me that he liked Catholic weddings.” Could the appealing form of a Catholic wedding be the door to embracing the Catholic faith? Fr. Pedro Tomaselli, PIME, poses with parishioners from opne of the two Churches that he is the Pastor of in the Tochigi Prefecture, just north of Tokyo.